Can you figure out the Secret Code that links these Genius Cards together? The Greatest minds in history, from Caesar to Beethoven to Freud come together to challenge you. 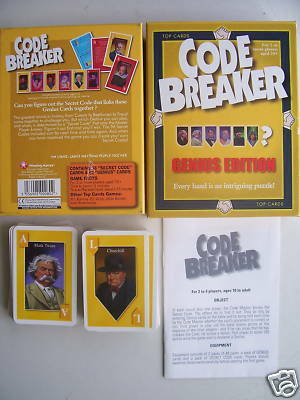 But whitch Genius you can play, and when, is determined by a ''Secret Code'' that only the Master Player knows. Figure it out first and you'll win. The 96 Secret Codes included can be used time and time again. And when you have mastered the game you can create your own Secret Code!